Delivering exceptional functionality and durability, Parker’s extensive line of hydraulic pumps deliver ideal performance in even the most demanding industrial and mobile applications. 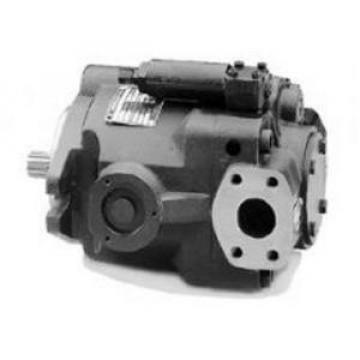 Parker’s comprehensive line includes gear pumps, piston and vane pumps, gold cup hydrostatic transmission pumps and flow dividers and intensifiers.The combination of different cartridges in double and triple pumps allows low flow at high pressure (300 bar max.) and high flow at lower pressure. This is a clever way to optimize your circuit design. This pump feature will also allow a very fast pressure cycle change with a very precise flow repeatability.On M5 series, an efficiency up to 90 % overall at 300 bar for M5A* and 320 bar for M5B*.Vane pin holdout design improves the mechanical efficiency at low pressure. The high starting torque efficiency of the vane type motors allows them to start under high load without pressure overshoots, jerks and high instantaneous horsepower loads. The vane, rotor andcam ring are pressure balanced to increase life over the full speed range. Double lip vanes reduce the sensitivity to fluid pollution. On M3 and M4 series, the high starting torque efficiency of vane type motors makes them especially applicable in load hoist winch drives, swing drives and propulsion drives. This high starting torque efficiency allows the motor to start under high load without pressure overshoots, jerks and high instantaneous horsepower loads.